From atop the cityscapes of Singapore lies a breathtaking view of our green city. 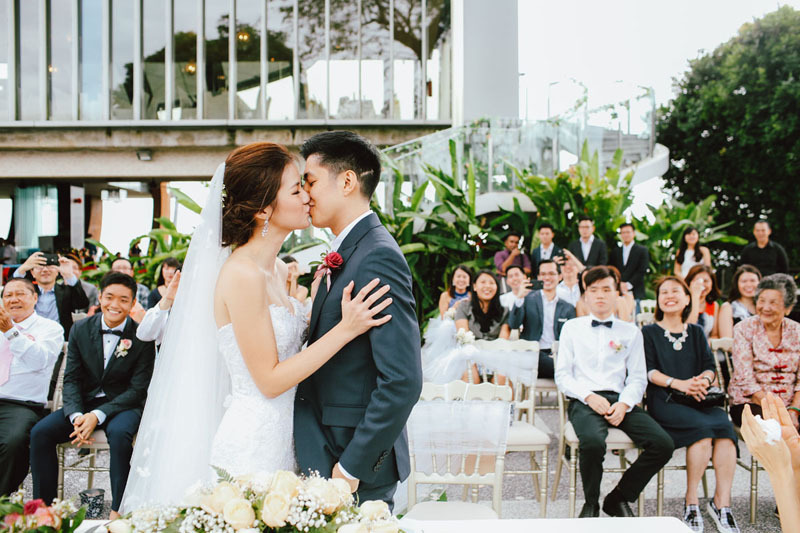 At Faber Peak, Singapore’s only hilltop venue, you will find nature and artistic design come together to bring you a unique wedding venue promising an unforgettable celebration. As featured in our Noteworthy Wedding Venues of 2018 and Top 10 Garden Venues in Singapore, Faber Peak lies nestled on the hilltop of Mount Faber. It overlooks a mesmerising panoramic view of the city, lush greenery and harbour vistas. As the latest wedding trends show couples tend towards cosy, intimate celebrations, Faber Peak is one such alternative venue that has grown popular for weddings. With both indoor and alfresco spaces for your choosing, read on to find out more about this charming wedding venue. Faber Park has 3 extraordinary venues for you to choose from for your wedding celebration. Whether you pick one of the indoor or alfresco venues at Faber Peak to host your celebration, you will find yourself surrounded by breathtaking scenery. Sitting at the highest point of Faber Peak is their Private Dining Room that offers you a truly intimate experience with an extraordinary view. Encased with glass walls and framed with graceful Hiba wood arcs, the Private Dining Room has the unique design of a crystalline glass alcove – making it a perfect observatory spot to feel on top of the world. Feel your heart skip a beat as you soak in the panoramic views of the vibrant sea, Sentosa harbor and the beautiful stretch of nature from Mount Faber Park. As dusk falls, streaks of natural light come in through the glass windows to enhance the romantic ambience. If you are searching for an exclusive space, this venue will certainly dust your wedding with magic. Day weddings are especially stunning here. Its capacity seats 70 guests, and it also features a sheltered alfresco terrace which seats 10 guests for an intimate wedding solemnization. With its raw wood elements exuding a rustic charm, the timeless beauty of this outdoor deck will surely captivate your guests as you say “I Do”. The Ballroom, which seats up to 200 guests, shares a similar layout to hotel banquets that you are familiar with. It is an ideal space for couples who are looking to keep it traditional and convenient but still want a special touch. 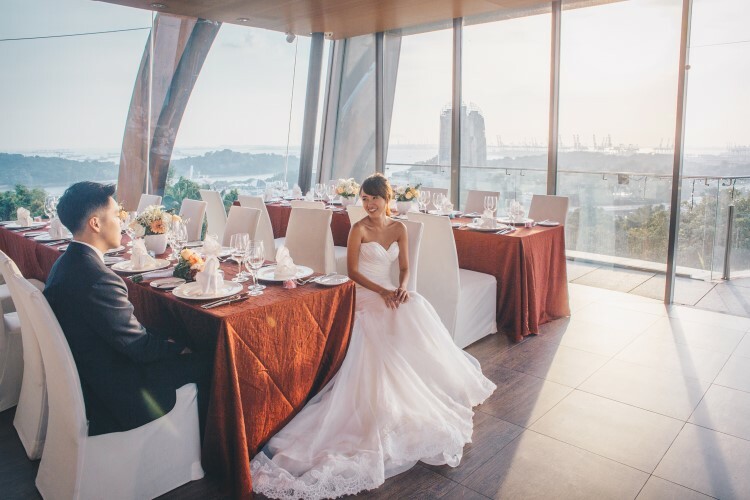 In replacement of walls that surround the usual ballrooms are floor-to-glass ceiling windows that allow you and your guests to admire the spectacular view that lies beyond. Both day and night views present something special of their own. In the day, you can clearly see the lush greenery of Mount Faber and cruise ships at the habour. Whereas when evening falls, you get the sparkle of lights from the cable cars and cityscape below. The Ballroom gives you the best of both worlds – air-conditioned comforts yet not forgoing the splendid view and surroundings. Your solemnization at the staging area will also enjoy a unique never-seen-before backdrop of cable cars passing by! Conveniently, both the private dining room and ballroom has a powder room for you to do your touchups. My favourite spot at Faber Peak is Arbora. This refreshing open space combines a gorgeous view with fresh air, sea breeze, and blue skies! Here, it is likely to get high on happiness alone, though the bar counter serves up pretty good concoctions too. This space seats 230 guests and the buffet set up ensures guests enjoy the evening mingling with each other in a relaxing atmosphere. The international buffet selection even includes a carving station serving up a 150 days Grain Fed Roast Beef Striploin! For the convenience of your guests to get to the venue, the Arbora package can include a 2-way 49 coach transfer service (from 1 location to Faber Peak), or a 24 seater bus from Habourfront. Click here for the full package inclusions. When you book your reception at Faber Peak, you can request for your solemnization at The Garden – an intimate space surrounded by verdant greenery. The tall Angsana trees here provide shade and tranquility to the garden. Exchange your vows and give the century-old Bell of Happiness a ring to celebrate the meaningful occasion together! The Garden seats up 30 guests. On top of the lovely venues that Faber Peak offers, your guests will also have a great time tucking into the exquisite menu. Choose from their Chinese, Asian Fusion, Modern European or International Buffet selection. Click here to see their menu options. For one of the biggest milestones of your life, be sure to select a wedding venue that can make your big day feel special. Faber Peak combines the tranquility of nature with charming architecture to bring you an unforgettable experience. This post was brought to you by Faber Peak Singapore. 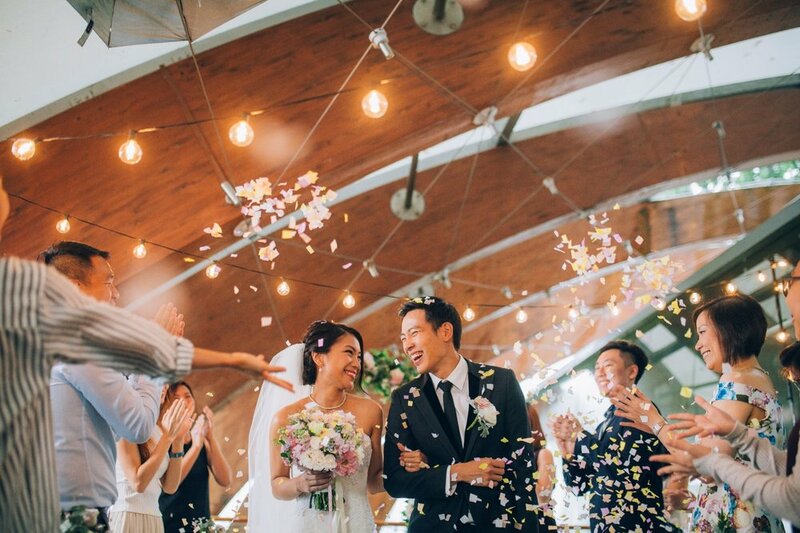 Featured image credits to Singapore Brides. All opinions remain writer’s own. For more information, kindly refer to our copyright & disclosure policy.